Former PM Ehud Olmert admits in court to two counts of obstructing justice, as part of plea bargain. Former Prime Minister Ehud Olmert has admitted to two counts of obstructing justice as part of a plea bargain. The two charges deal with the Holyland and Talansky affairs. In exchange, prosecutors agreed to demand that the punishment for the Talansky case not be added to the Holyland sentence, but rather consist of half a year in prison to be served concurrently. This is in addition to the fine of 50,000 shekels ($13,000 US). 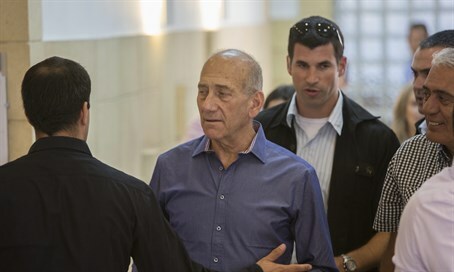 Olmert will not be charged with removing a witness, even though the charge against him is primarily based on recordings presented by the head of his office Shula Zaken. The recordings featured Olmert apparently asking her not to testify against him. As noted, the latest admission and conviction came about due to the recordings of Shula Zaken, which were introduced in a late stage of the trial. The former Prime Minister offered compensation and financial support to Zaken in exchange for her not testifying in court.